It's OK. You don't need to hide it from us. Your common room is a dungeon, your ghost is the Bloody Baron, and your colors are green and silver. Your animal is the serpent and you may even be able to speak parseltongue (though we kind of hope not). You're a Slytherin! We think that's great. We mean, sure, a few Slytherins have kind of given your house a bad name. OK, more than a few. But you look like a sharp, bright young witch with powerful magic, a drive for success, and a cunning mind. And we think this Child Slytherin Skirt belongs in your school trunk! Far from bashful, you should feel proud as your strut through the Hogwarts halls in this licensed look. Whether you wear it to potions or you sport it trick or treat on All Hallows Eve, this skirt is bound to snake its way right into your heart as your most beloved clothing item. 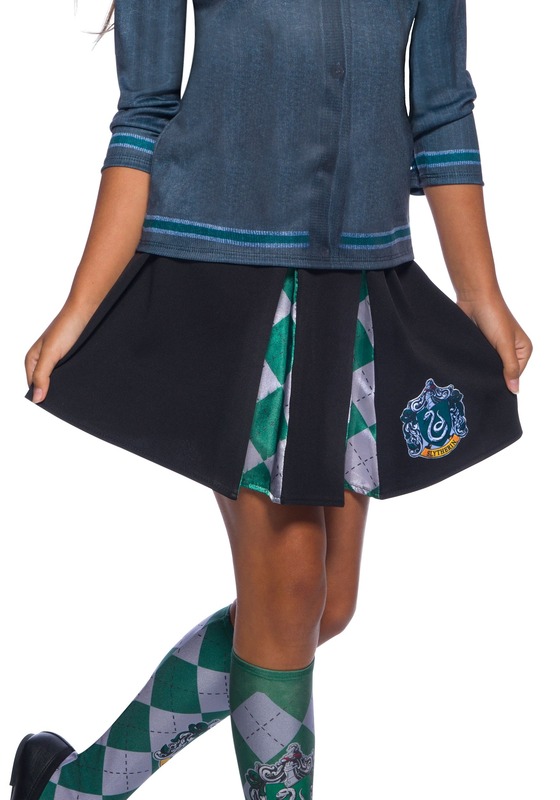 This short A-line skirt features panels of silver and green checkered patterning, along with the Slytherin house crest. It looks great paired with school robes, a Hogwarts sweater, or Slytherin socks! So don't hide your Slytherin ways, show them off. After all, Harry was almost sorted into your house for his "certain disregard for the rules." You share a lot of great qualities with "the boy who lived." Now go out there and write your own magical story!